There are many different types of water meters around Logan City, Brisbane & the Gold Coast. All of them do the same job, which is to measure the amount of water that passes through them to your property. (The amount of water that you’re using or loosing). Your water meter is most likely located on the nature strip outside the front of your property near the road. It is the home owner or occupier to keep this meter accessible at all times. Some water meters have digits & others have dials, some have both, but they are read the same way. Your council officer will read your water meter 4 times a year. All the water used is charged to the home owner. Moyle Plumbing receives their water bill every January, April, July & October. To read your water meter, the red numbers represent the litres used, while the black numbers represent the kilolitres used. The first 99 kL (99000 L) is usually charged at a lesser amount of $1.09 per kL. All water used after this is charged at a higher amount, usually around $2.81 per kL. If you have had a spike in your water use, you may be alerted by a letter from Council to a suspected water leak on the property. If you notice a water leak at the water meter, you have a 50% chance of it not being yours. We recommend you check this before calling your plumber. 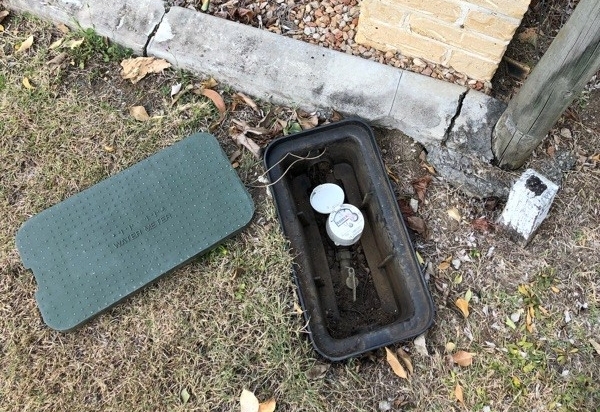 If the water leak is on the house side of the water meter, then it is your responsibility to have it repaired by a licenced plumber such as Moyle Plumbing, however it the leak is on the road side of the water meter, then it may be Council responsibility. If you are unsure, give Moyle Plumbing a call & we will try to help or give you some valuable advice. If you suspect that you have a water leak & you have checked your taps & toilets for any obvious leaks, then it’s now time to check your water meter. Turn off your taps & appliances that use water. Check your water meter for any movement to the digits or dials. If they are moving at all then you have a water leak. But wait- Just because they are not moving doesn’t mean you don’t have a leak. You may still have a slight or small water leak. To test this, you do the same test, but leave it longer. Write the numbers down or take a photo with your smart phone on your way out to the shops & when you return, check the digits for any movement. Make sure that there was nobody home using water while you were out. If you have a leak, call your licensed plumber such as Moyle Plumbing & Gasfitting on 38077327.